This script will dump all of The Sims 4 game XML into the xmldump subfolder of your Electronic Arts game documents folder. This is primarily useful for modders on Mac computers where the more advanced Windows tools XML Extractor or Sims 4 Studio are unable to provide the game XML for modding purposes. The extracted XML files are very basic, the script is unable to produce comments with strings and cross reference names and it cannot access and dump the Jazz animation files. But since it runs as a Python script within the game it does allow Mac users to get the game XML without having to deal with using another computer, WINE, Parallels or other methods of attempting to get the Windows programs to run. Since this is a new technique for extracting the game XML there may be some files which have errors in them (the only likely problem I can think of might be some invalid XML characters in the output) or possibly even some missing files. Every file I inspected validated correctly. This works by forcing the game to reload all the XML (which have already been converted to Python objects and removed from memory) so that the files can then be dumped to the hard drive. This process uses a lot of computer memory! It is not recommended to run this script unless you have at least 8 GB of RAM on your system. It may be able to finish and produce results using virtual swap memory; however, this will slow down the extraction significantly. Although it should be perfectly safe to continue running your game after using this script (it cleans up after itself to free up that memory) it will likely be best to exit the game and restart after extracting. Install the script as you would any other script mod, open a cheat command window with the Ctrl-Alt-C key combination and type in the xmldump command to begin extracting the files. This will take a significant amount of time (over 2 minutes on my system with only 5 game packs installed) during which the game will be paused (you may see some animations complete or continue to loop). When completed the command window will indicate the results. By default the files will use the S4PE file naming conventions for the dumped XML files. You can extract using the Sims 4 Studio file naming convention by using the xmldump s4s command. The files will be extracted into subfolders for each game pack within the xmldump subfolder of your Electronic Arts game documents folder (one folder up from the Mods folder, where the save folder is also located). 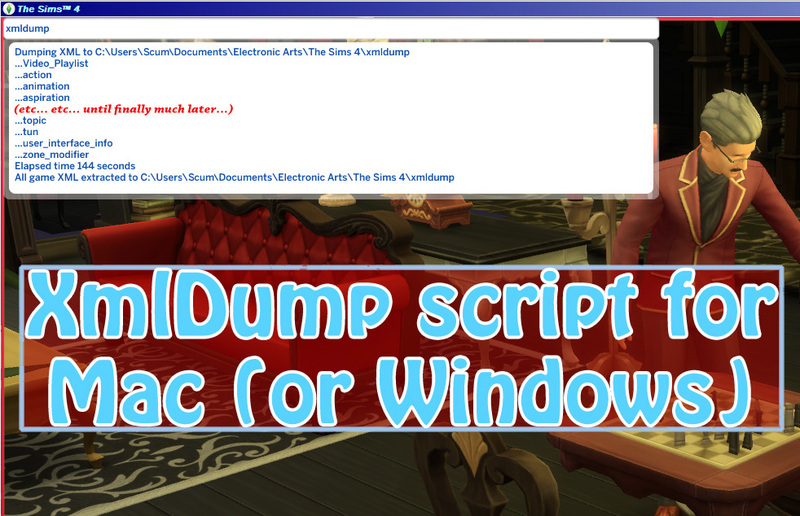 The mod is installed, like any other script mod, by placing the MTS_Scumbumbo_XmlDump.ts4script file into your Mods folder. As it is a script, you must have script mods enabled in your game options. The mod was written for The Sims 4 version 1.47.51 (November 20, 2018 game patch). It should continue to work with future game patches unless there are significant changes to the game's merged_tuning_manager.